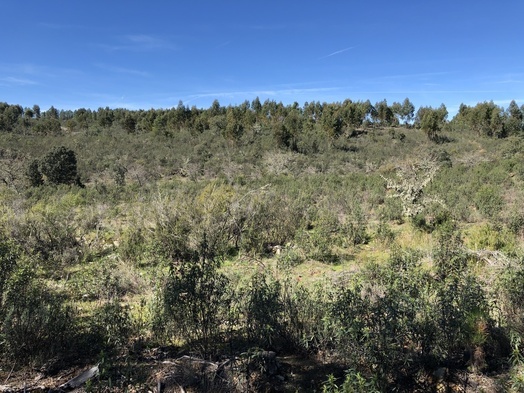 02-Mar-2019 -- This is the second out of four reports reaching confluence points during a bicycle trip from Lisbon to Madrid. The story continues from 40°N 8°W. With the first daylight, I started cycling from the town Fundão, which is 50 km to the west of this confluence point at 7.5°W. At noon, I reached the confluence, which is 2.5 km from the main road N239. Three kilometres before leaving the main road, I came through the nearest town Penha Garcia. A labyrinth of dirt tracks exists around the confluence, and each track branches of every 500 m, so there are many choices to be made. But from the satellite image it became clear which one to take. The gradient was always pointing down so I just had to coast down – if the tracks' quality hadn’t been so bad. But I was able to bring my bicycle within 62 m to the confluence. I found the confluence at the bottom of a valley near a creek. Just 100 m from the confluence the creek is dammed creating a little water reservoir. The vegetation is mostly bushland with scattered trees with long white lichen beards. I also spotted mysterious truffles. May be I shouldn’t have noted this here – there is the risk that they may get collected. After the visit, I continued my trip further east on lonely and remote country roads. I spent the night in Plasencia. Vegetation: pine trees, lichen, bushes, grass, truffles. The story continues at 40°N 6°W.